About half way through the school year, students have an opportunity to pitch and direct or act in three plays that will be performed on our small stage. Nick is a single, Italian-American guy from New Jersey. His parents retired and moved to Florida. That doesn't mean his family isn't still in Jersey. In fact, he sees both sets of his grandparents every Sunday for dinner. This is routine until he has to tell them that he's been offered a dream job. The job he's been waiting for—marketing executive—would take him away from his beloved, but annoying, grandparents. He tells them. The news doesn't sit so well. Thus begins a series of schemes to keep Nick around. How could he betray his family's love to move to Seattle, for a job, wonder his grandparents? Well, Frank, Aida, Nunzio and Emma do their level best, and that includes bringing to dinner the lovely—and single—Caitlin O'Hare as bait…we won't give the ending away here. Caitlin Rogers is honored to be in charge of such a talented cast and direct such a realistic show. At sixteen, Joey has just committed suicide. Through narration and a series of flashbacks, Joey shows us the life he used to lead and why he chose to end it -- but we also see the unexpected effect of his death on his classmates, teachers, and family. Jade Pettit and Kasey Gates are extremely talented sophomores who feel privileged to direct such a dramatic masterpiece. They would also like to extend a warning that this show is for adult audiences only. 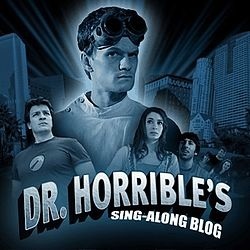 Dr. Horrible, an aspiring super villain with his own video blog, is attempting to join the prestigious Evil League of Evil but his plans are usually foiled by the egotistical superhero Captain Hammer. Horrible's life is thrown for a loop when he falls in love with Penny, a beautiful and optimistic advocate for the homeless he meets at the laundromat, a situation which complicates itself even further when Penny begins dating the boorish, oafish Hammer after he apparently saves her life. Faced with the task of impressing the League, can Horrible overcome his own incompetence to ruin the day, kill the hero, and still get the girl? Marshal Meador and Trevor Sandy are very proud to direct this hilarious show.